If you wanted to buy a home, and someone said to you, “We will help you find the home you want, and when we’re done, we will mail you a hero savings check in the amount of $2,000 simply because you serve the community,” would you believe them? It’s no joke. Homes for Heroes has done this nationwide for tens-of-thousands of heroes like you. It’s what we do and we do it well. Here’s a look at our process and how easy we make it to get your hero savings. You must work with at least one of our specialists through the closing process of a home and/or mortgage. Previously or currently work in one of our hero professions: law enforcement, military, firefighter or EMS, healthcare or teaching. Simple. That’s how we aim to make it every step of the way for you. To further clarify, our hero professions are broad professions that contain any number of specific job titles. For example, “law enforcement” covers police officers, sheriff’s deputies, corrections officers, dispatchers, troopers and more. “Military” covers active duty, reserve and veteran members of every branch of the armed forces. So, if you consider yourself part of one of our hero professions, chances are you qualify for the Hero Rewards savings we offer. Honestly, there is no “application process.” Simply sign up on our website. We need some information to provide the best service; including your name, contact information, hero profession (past or present), what you want to do, where you want to do it, and how you heard about Homes for Heroes. That’s it. There’s no obligation. Just a few short answers to get things started! Once you’re signed up, you don’t need to search through some online catalog to find your own real estate agent or lender. Instead, our system will automatically connect you with a specialist in your local area. Better yet, after submitting your information online, our specialist will contact you within 24 hours to answer your questions and get the ball rolling! Whether you’re looking to buy, sell or refinance a home, our local specialists will work with you to accomplish what you want. We partner with real estate, mortgage, title and home inspection specialists to save you money throughout the process. By working with our specialists, heroes receive reduced fees and commissions that add up to an average savings of $2,400. There are other programs that offer similar benefits to Homes for Heroes. But, we guarantee the most hero savings among all national programs and 92% of our heroes have given us 5 out of 5 stars. Often hero feedback reflects tremendous appreciation for the service they received from Homes for Heroes specialists, in addition to the savings. Other programs have extensive criteria heroes must meet before they’ll work with you. Not us. We believe you work hard serving your community. That’s enough for us to provide you with extraordinary service and savings. 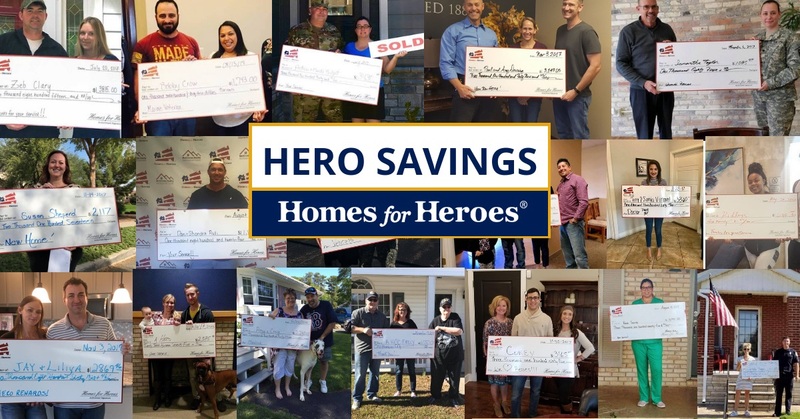 When you add up the hero savings potential through your Homes for Heroes specialist team; including a real estate agent, loan officer, title company and home inspector, you’ll save more and get better service when you choose Homes for Heroes. Simply put, we’re committed to serving heroes and maximizing your hero savings. It’s our way to say thank you for all you do for your community, and our country. Sign up today and see why Homes for Heroes is the best choice for heroes looking to buy, sell or refinance a home.